The Law Society is calling for a root-and-branch overhaul of civil legal aid provision to help repair the damage inflicted by deep cuts four years ago. Full story: Law Society Gazette. New cases started in family courts up 4% on a year ago. Full story: Family Law Week. Mediation starts also down on a year ago. 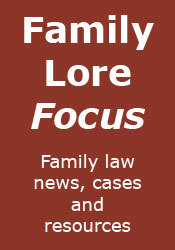 Full story: Family Law Week. A paid McKenzie friend has been denied permission to appeal against a decision that banned him from being involved in a family dispute and criticised for describing himself as a ‘quasi-solicitor’. Full story: Law Society Gazette. See report, below. Judges at the European Court of Human Rights have rejected a plea from the parents of terminally-ill baby Charlie Gard to intervene in his case. Full story: BBC News. A British Sikh couple are bringing a legal case, claiming they were advised by an adoption agency not to apply because of their “cultural heritage”. Full story: The Guardian. The child maintenance system is failing to ensure children receive the appropriate level of support they are entitled to, according to a new report by Gingerbread. Full story: Gingerbread. Application by husband for declaration that sale documents could be sent to wife without naming purchasers, to prevent wife frustrating order for sale. Full report: Bailii. Appeal by father against refusal to enforce Estonian contact order, on the basis that the order required the contact to be supervised, and there was no child welfare authority or child care professional willing to supervise the contact and no order could be made to compel this. Appeal dismissed. Full report: Bailii. Application by mother in contact proceedings for permission to appeal against order excluding McKenzie friend from future involvement with the proceedings. Permission refused. Full report: Bailii. Care proceedings regarding baby of mother from ethnic minority community, in which the mother agreed to adoption but did not want the father to be given notice of the proceedings, as the mother feared the reaction from her family and in the community within which she lives. Full report: Bailii. Application by mother to set aside order requiring her to return children to America, on the basis of a subsequent change in circumstances, namely a deterioration in her mental health, which could deteriorate further if the children had to return to America. Full report: Bailii.